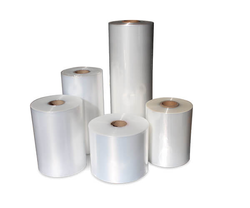 Clear or printed Shrink Hood Film Roll, in rolls and bags, for wrapping pallets with high heat and strong puncture resistance, excellent shrinking ratio, see-through clarity and visible performance. These rolls are designs by dexterous professionals using quality approved basic material and modern technology. Our offered roll is highly demanded in the market for their fine finishing and top notch quality.